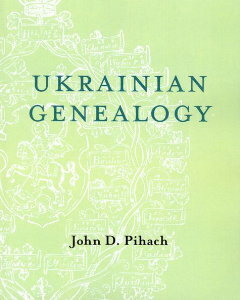 John D. Pihach’s book Ukrainian Genealogy is the most comprehensive and important book for Ukrainian genealogists available. 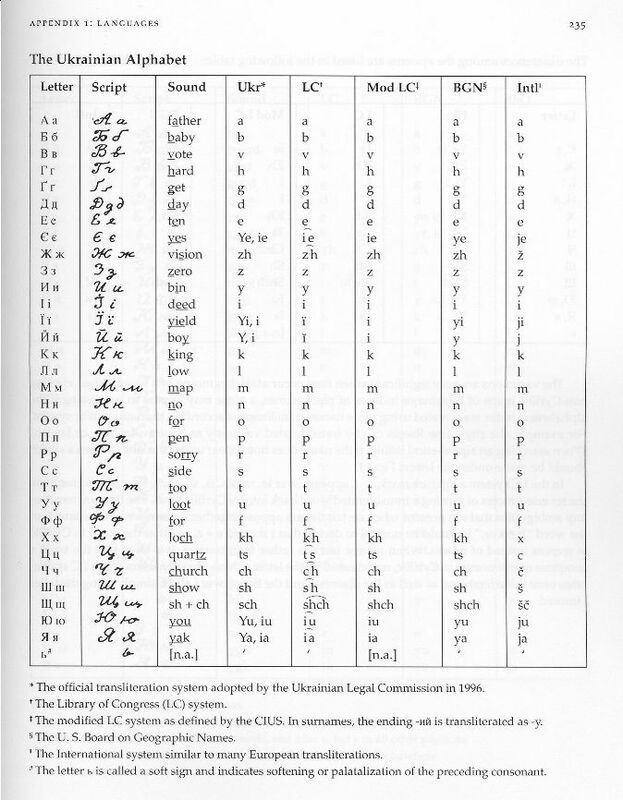 Pihach has successfully reined in the many aspects of Ukrainian genealogy into one text. For the novice genealogist, he introduces the subject by providing a background on the history of Ukraine and Ukrainian immigration to North America. He further covers the complex issue of language by presenting a detailed, yet easy to read, account of Ukrainian given names and surnames, as well as language usage as found in various documents important to the genealogist. Although the book is subtitled “A Beginner’s Guide”, Pihach provides an exhaustive study of maps, cadastral documents and a vast collection of footnotes and citations that are sure to entice the experienced researcher. The logical layout of the book allows it to serve as a trusty reference to be returned to time and time again. Pihach explains that the book is “a guide to tracing one’s Ukrainian ancestry in Europe. It is not a guide for those wishing to trace their roots on this continent…Consideration, however, is given here to those North American records that are specifically Ukrainian or relate to the immigrant experience”. Pihach presents North American records only in relation to Ukrainian research in Europe or to determine one’s ancestral village. This covers passenger lists, immigration records, naturalization and citizenship records, census, homestead and land records, etc. Pihach’s must read book is broken down into 12 chapters, 3 appendices, and an impressive bibliography. The first two chapters are an introduction to Ukrainian genealogy. They deal with starting your research, both in general genealogical practices as well as specific to Ukrainian research. Pihach provides a brief history of Ukraine and of Ukrainian immigration to North America. Furthermore, a history and background of Ukrainian church records in Canada and the US can be found in chapters 4 and 5. Due to a colorful past and complex terminology, the subject of Ukrainian national, immigration and church history is not as easy as one might think. Yet Pihach successfully gives the reader an excellent overview, which serves the genealogist to better understand his/her own rich national heritage, as well as to provide direction in terms of finding and interpreting vital records and various other important resources. An entire chapter is devoted to the singular, most important task of the Ukrainian genealogist, that of locating the ancestral home. Pihach, due to Ukraine’s rich history, must illustrate research methodologies covering several countries and time periods: The Russian and Austro-Hungarian Empires, as well as Poland, Hungary, Romania and the USSR. Pihach goes into great detail explaining the geographic breakdown of the various countries and time periods necessary to assist the researcher. Furthermore, Pihach describes the array of invaluable gazetteers available. Several chapters of Pihach’s book are dedicated to vital records, the basis of most family research. The book covers all the necessary aspects of vital records. Pihach explains record keeping practices across national borders and time periods. Furthermore, he explains the various availability and location of records. Pihach has personally visited archives all across Central and Eastern Europe. His intimate knowledge of the archives, as well as their practices and catalogues, is a gift to all researchers. Pihach includes a Ukrainian archive request letter writing guide and explains the procedure for on-site archival visits in Ukraine. The author’s depth of subject material is mind-boggling. In addition to writing about on-site research, Pihach brings to light the availability of records and research opportunities found on the internet. Pihach is completely abreast of the most current information. 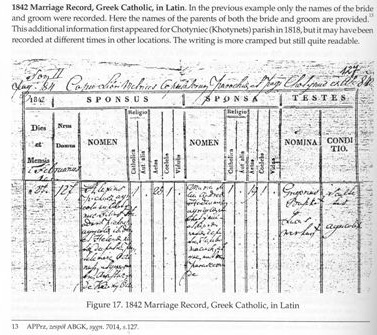 Pihach details the various types of vital records, both Greek Catholic and Orthodox, both Austro-Hungarian and Russian Empire, both Roman and Cyrillic alphabets. Pihach takes us on an exciting tour of records from the late 18th to the 20th centuries giving great detail in explaining the documents and provides a number of illustrated examples. He translates the documents section by section providing a short selection of common terms found in different languages, covering Ukrainian, Russian, Latin, Polish, German and Romanian…(who says Ukrainian research isn’t fun?). As every genealogist knows, there’s more to research than vital records. Since the break-up of the Soviet Union and fall of Communism in the early 1990’s, new documents have only recently become available. One of the most important features of the book is the entire chapter on Austrian land records. 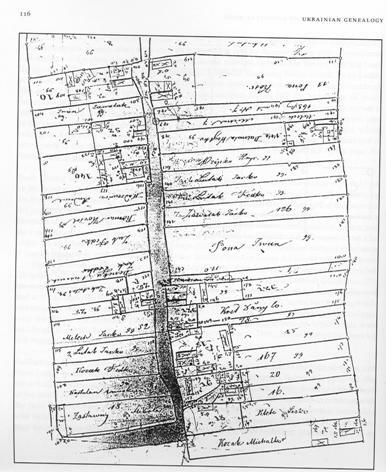 Pihach writes: “When Austria acquired Galicia, in order to establish a reliable basis for land taxation the authorities initiated land and tax reforms that required the measurement of all land properties in the new crownland.” Pihach explains the 19th Century documents which serve as a complete picture of a village, a snapshot in time. Pihach also writes about the many types of maps available for research. He illustrates over a dozen of the most popular and informative maps by featuring the village Chotyniec, located on the Polish-Ukrainian border. By using the one village as an example, Pihach is able to go into great detail about each of the map series. Included in the study is an in-depth discussion of the cadastral maps and associated texts, an exciting feature of Austro-Hungarian research. The maps and texts, created for taxation purposes and settling property disputes, allow the researcher to reconstruct the ancestral community. Pihach writes: “…literature about cadastral surveys and maps in English is scarce”. Pihach fills the gap by bringing to light this incredible resource. In addition to a complete list of essential archive addresses (covering Canada, US, Ukraine, Poland, Slovakia, Hungary, Russia and Romania), the book contains three appendices. 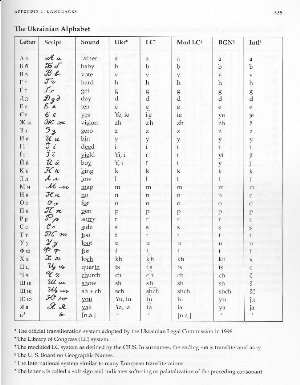 The first, “Languages”, covers several alphabets, including Ukrainian and Russian (along with various transliteration systems), Church Slavonic, Polish, German and Romanian. Examples of cursive writing are also included to help with interpreting records. 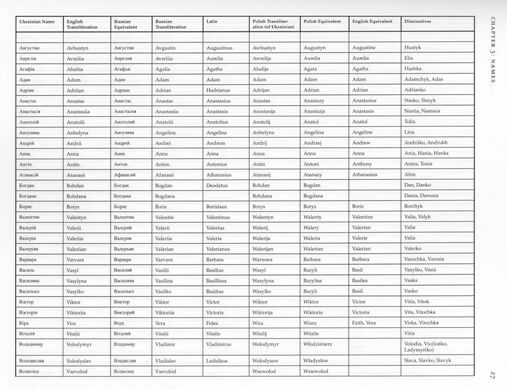 The second appendix gives contact information on other ethnic groups located in Ukrainian territories, such as Polish, Jewish, German, Mennonite, Rusyn (aka Carpatho-Rusyn), Czech, Slovak and Russian groups. The last appendix lists useful web sites. This last subject is a challenge for publications in print since web sites often come and go. But Pihach careful chooses the most essential and informative internet sites. Finally, an exhaustive bibliography, 12 pages worth, is provided. The bibliography is broken down by category making it easy to follow and reference. These last two sections are sure to keep the genealogist busy…and well informed! I strongly urge everyone researching, or on the verge of starting to research, his/her Ukrainian roots to run, not walk, to get a copy of this book! Pihach has managed to bring all components of Ukrainian genealogical research into one book. I’m confident that every genealogist will refer to this book over and over again.